Hail is both destructive to vegetation and manmade structures. Hail is classified as severe by the National Weather Service if it is equal to or greater than 3/4" in diameter. Strong winds make these darting spheres of ice even more damaging. It is difficult to pin point where exactly a large hail shaft will strike just as it is difficult to predict where tornadoes will exactly occur. However, the general region where hail can be expected is very predictable. Hail occurs in association with thunderstorms, particularly supercell thunderstorms. 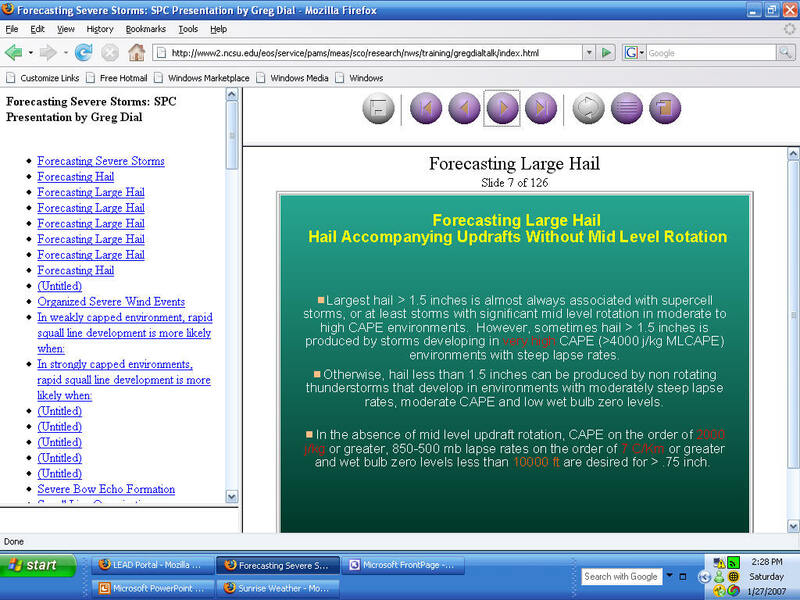 Below are factors to consider when trying to forecast for the likeliness and size of hail. 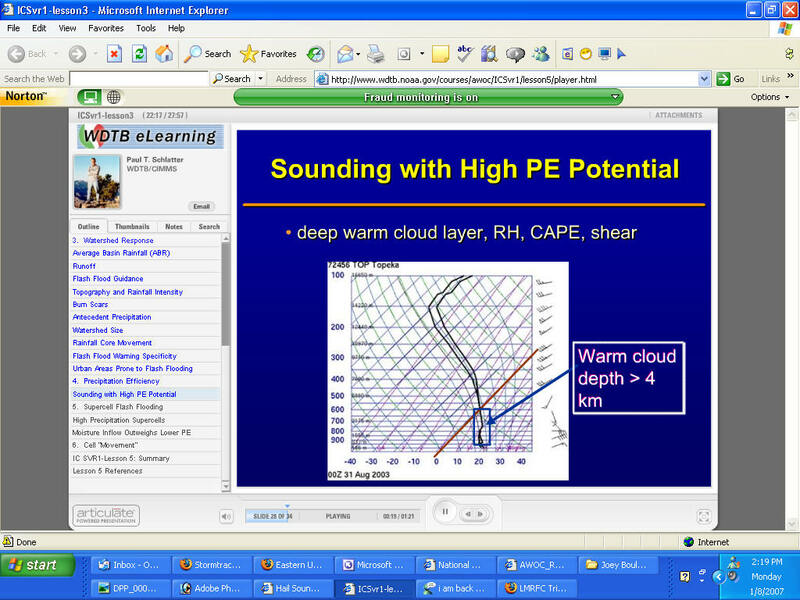 Higher elevation areas are closer to the cold layers of the upper atmosphere. When a hail stone falls, it rapidly begins to melt when the environmental temperature rises above freezing. If the hailstone has to fall through a deep layer of warm air, it will melt from the outside in, turning into non-damaging raindrops or decreasing significantly in size. Mountainous regions and the High Plains of the United States have the highest number of hail days per year. 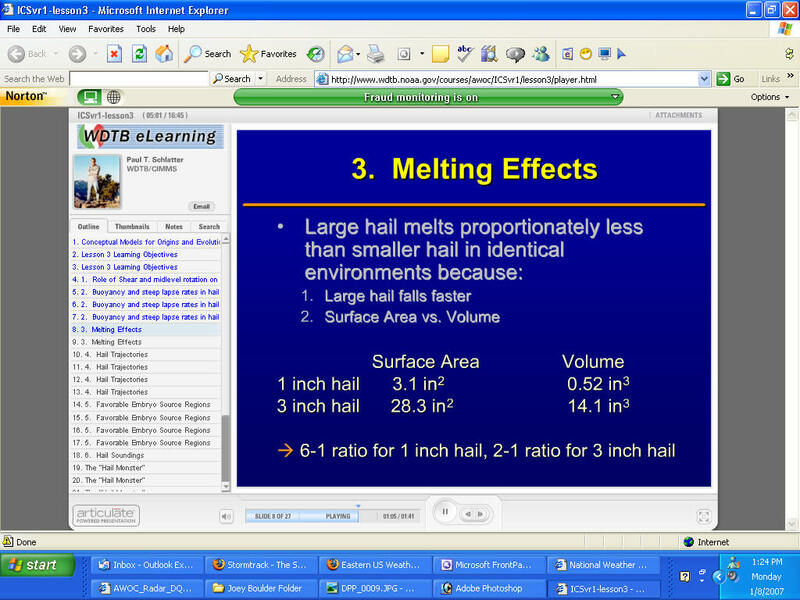 Small hail which would normally melt before reaching the surface in a low elevation area reaches the surface in high elevation area. Storms do not need to be as severe in the lee of the Rockies as in lower elevation areas for hail to reach the surface. The freezing level determines the depth of the atmosphere that is above freezing. If the freezing level is high in the atmosphere, hailstones will have more time to melt than if the freezing level is close to the surface. A high freezing level also decreases the vertical depth in which hailstone formation and growth is possible. 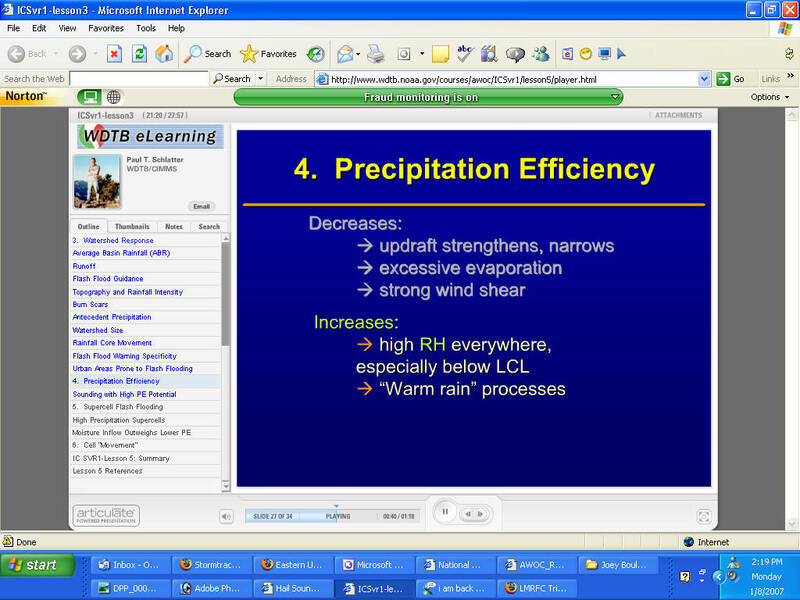 The freezing level depends on elevation, the season, and the temperature profile of the atmosphere. High elevation areas will have relatively low freezing levels in all seasons. For low elevation areas a general rule to follow is: If the freezing level is closer to the surface than 650 millibars, strong thunderstorms have a good probability of producing hail that will reach the surface. 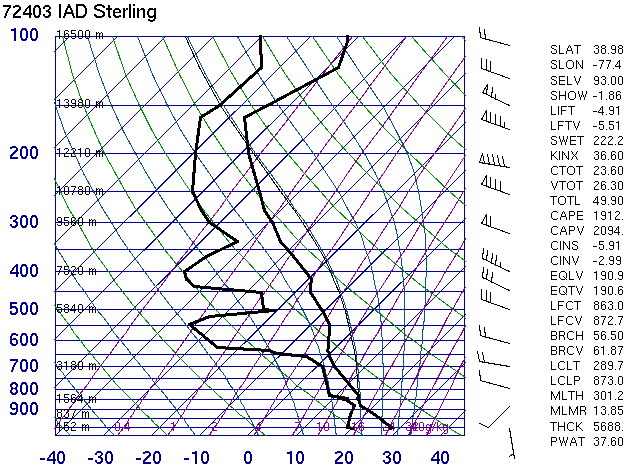 The freezing level can be found readily by examining the morning or afternoon Skew-T Log-P plot or forecast sounding. The wet bulb zero level is defined as the freezing level that will result due to evaporational cooling. The freezing level will lower if there is dry air in the mid-levels of the atmosphere. This occurs due to evaporational cooling of environmental air that entrains into a thunderstorm. This same entrainment can also produce strong and gusty surface winds. Dry mid-levels are common in the Great Plains. This is another factor that leads to many hail days in this region of the US. 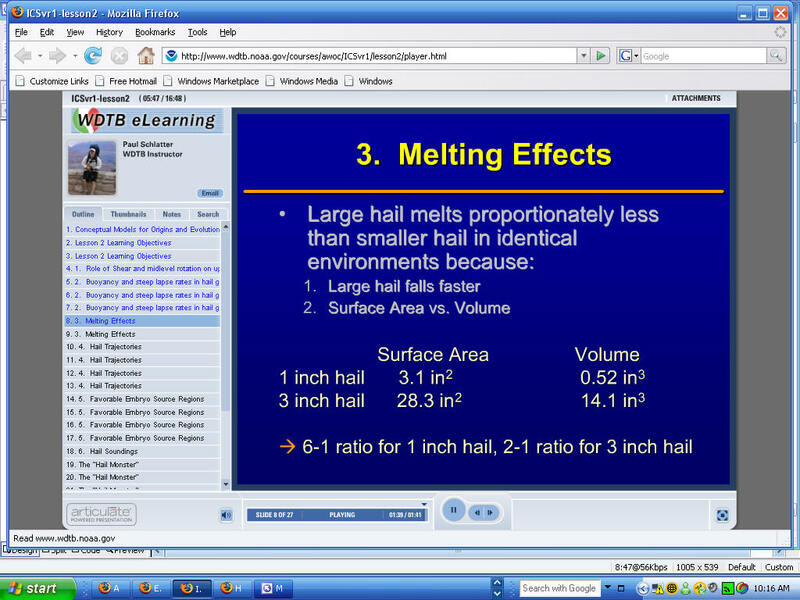 This is the most important factor in determining hail size. CAPES under 1000 J/kg generally produce borderline severe hail (near 3/4" or less) while CAPES over 2000 J/kg can produce very large hailstones. High CAPES lead to high upward vertical velocities within a thunderstorm. High UVV's can suspend hailstones and add layers of ice onto already developed hailstones. 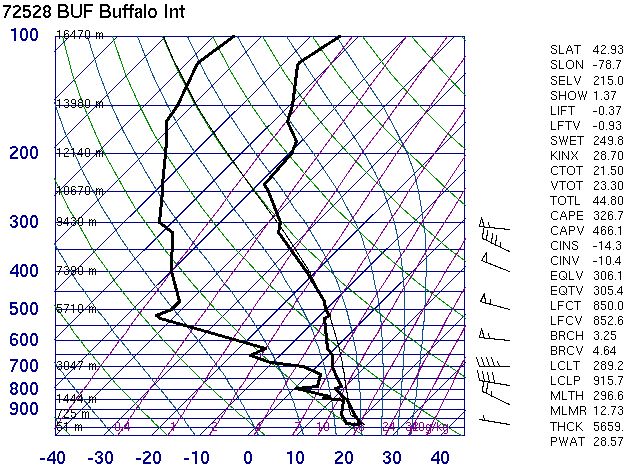 The amount of CAPE can be approximated by modifying the morning Skew-T sounding for that day. In many cases this is executed by changing the surface temperature and dewpoint to fit current observations. 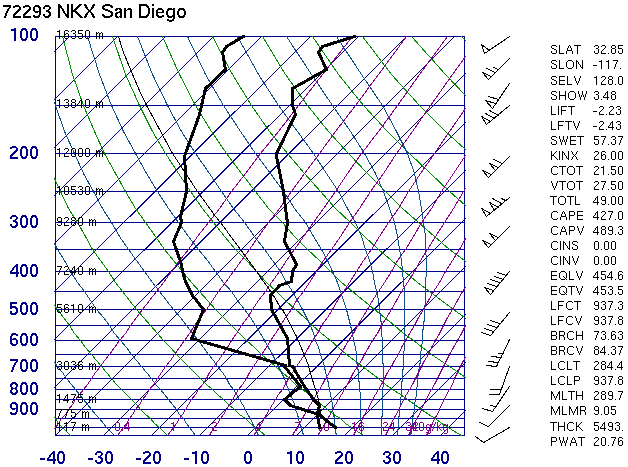 Forecast model soundings can also be examined for changes in CAPE during the day. Strong upper level winds allow CAPE to be maximized to its fullest potential. Strong upper level winds tilt the updraft of developing thunderstorms. This allows the updraft and downdraft to be separated from each other. This produces higher UVV's in the updraft. The weight of moisture and water will influence the strength of the updraft. High moisture soundings result in water loading. 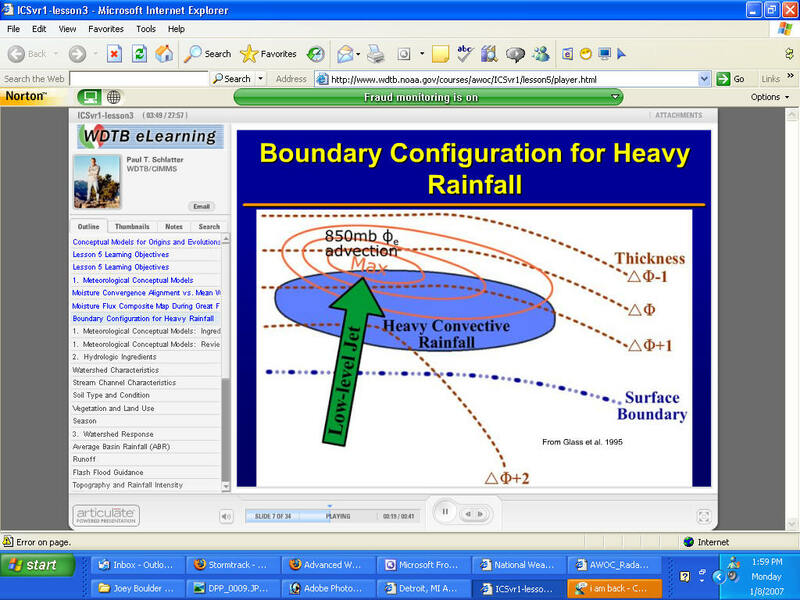 CAPE is reduced with water loading since the force of gravity pushes down on the liquid water drops. Precipitable water values of less than 1.0" will not be nearly as influenced by water loading than if precipitable water values are above 1.5". Lower precipitable water values have the potential to produce large hailstones when significant CAPE is present. Low precipitation supercells are notorious for producing large hail. In the lee of the Rockies, PW is climatologically low, adding to the hail potential. 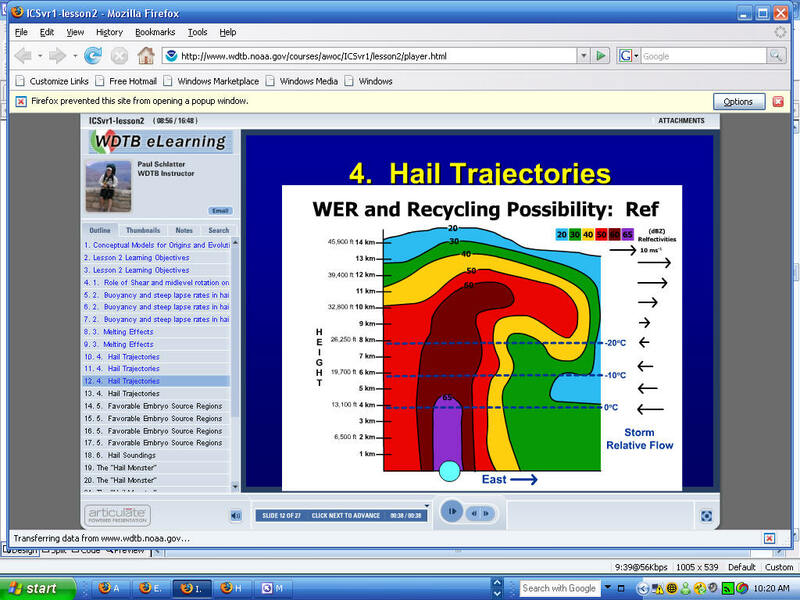 Hailstone size is maximized by high elevation, low freezing levels, low PW, dry mid-level air, high CAPE, and large wind shear. The region of the country that these factors come together the most are in the High/Great Plains of the US. Hailstone size is minimized by low elevation, high freezing levels, water loading (high PW), moist mid-levels, low CAPE, and weak wind shear. Higher the humidity the more likely the hail will melt faster...that and higher temperatures. Below images you can see the BWER and the intense hail chore aloft. 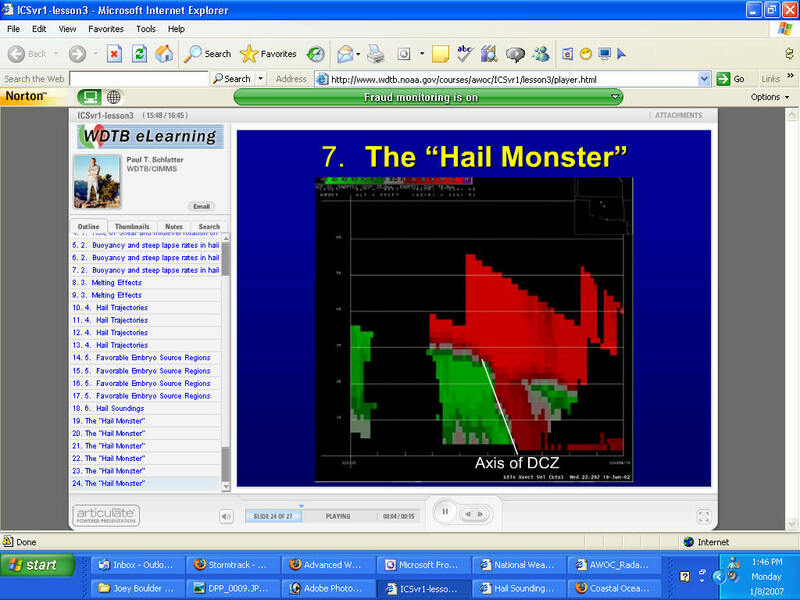 You can see the DCZ - Deep Convergence Zone - this is what you should look for as far as LARGE hail and hail storms. Cross section image velocity. Moderate: Would like to see more CAPE, but rotational potential is huge with any storm that gets going. The shear is so good it's tough to not go moderate risk. Good: 2124 J/kg makes it almost excellent, no CIN. Excellent: above -10 the lapse rates are nearly dry adiabatic up to -40 C.
Locations in Nashville reported golfball hail at 19 UTC. Additional supercells developed southwest of Nashville, all producing severe hail, and 3.00 inch hail was reported at 20:38 UTC 50 miles southwest of Nashville. None: Doesn't appear to be any elevated CAPE potential on the sounding, and the lapse rates are weak throughout the depth of the troposphere. Shear is very good however, thus storms get going north of the front they should rotate. It would be helpful to see the environment south of the warm front. It would be a stretch to label the severe hail risk "slight" north of the warm from without seeing what the atmosphere was doing to the south. There was elevated CAPE north of the warm front with a source of instability from the southwest. Rotating storms formed north of the warm front in the Detroit area (Wayne County), and they were large hail producers, with 3.50 inch hail at just before 15 UTC in Belleville (a picture of some of that hail is on the center of the banner at the top of the index page). There were 3 reports of golfballs and over 10 0.75 inch hail reports from this event, all with mid 40s surface temperatures. Very warm temp profile and lots of humidity melt hail faster...you can still have very large hail in those conditions if it is large hail to begin with. The subjective scale used for rating the parameters is "weak", "decent", " good", "excellent", and "begin crying" (a few instances a year that particular parameter is that high). 2. After diagnosing the hail threat by parameter, mentally decide on an overall hail threat, using SPC nomenclature of "none", "slight", "moderate", and "high". Then click the "Reveal" button to show what and why an experienced hail forecaster would have assigned each parameter and overall hail threat. 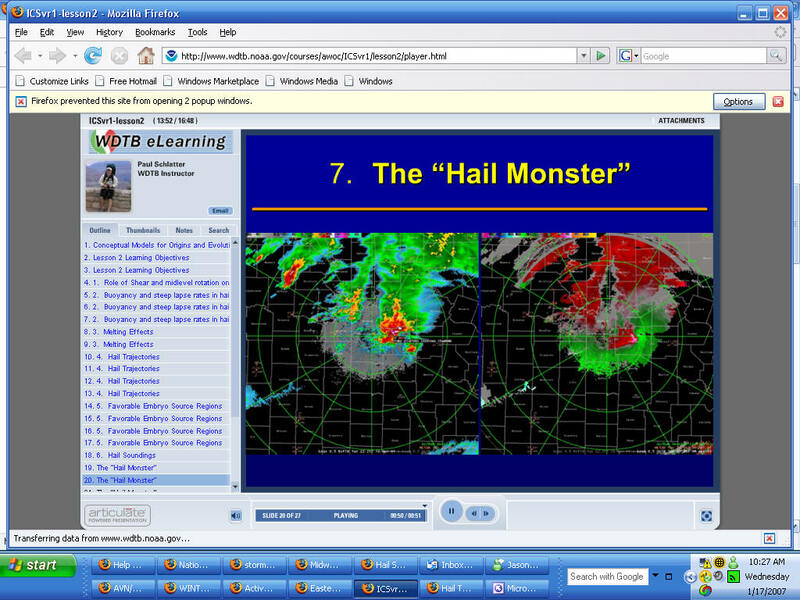 Clicking reveal also displays a brief summary of the hail event. Good: 1511 J/kg just above the very shallow inversion. Not much CIN. 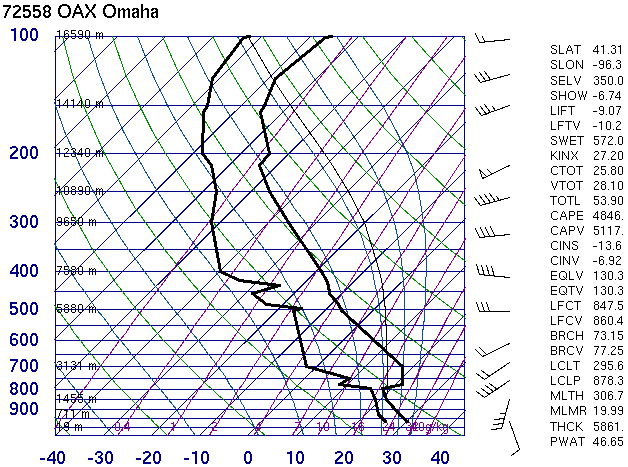 Excellent: If surface ob correct, then 0-6 km shear is 65 knots, with 80 knot winds at at 10 km. There is some decent veering in the lowest 2 km. Decent: weak above -10 C and there appears to be a cloud layer. 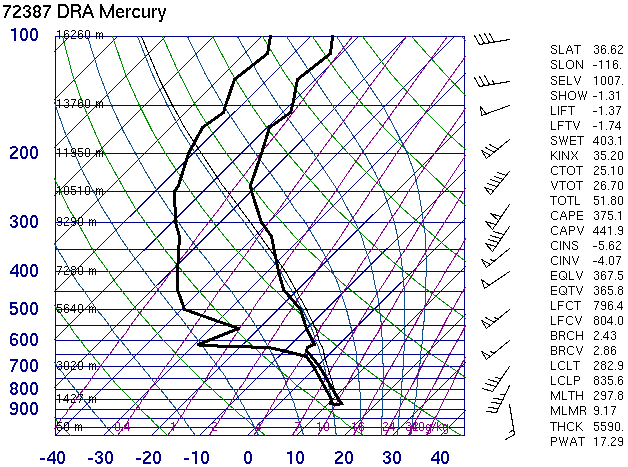 Its also moist adiabatic above -20 C.
Moderate: The CAPE is pretty good and the shear is great, but the mid-level lapse rates do not look favorable for significant growth within the hail growth zone, thus just a moderate. A squall line associated with an MCV resembling a "land hurricane" moved across the northeast U.S. It was mainly an embedded tornado and straight line wind event. Hail reports were surprisingly very scarce, with just one report from anywhere in PA/NY on the entire day: golfballs not far from Albany at 00:30 UTC 22 July 2003. Weak: 379 J/kg, nice low level lapse rates though. Decent: 0-6 km shear 25-30 knots, but there are 75 knot winds at 10 km. Slight: Not a lot of CAPE or shear, but combined with the lapse rates this deserves a slight severe hail threat. A cluster of severe thunderstorms initiated ahead of an approaching upper level short wave trough. 2.00 inch hail fell in extreme eastern Oregon at 23 UTC, and 1.00 inch hail at 00:05 UTC in western Idaho. The event as a whole was described as a "massive outbreak" in E. Oregon and W. Idaho. Slight: Not a lot of CAPE, shear is good but unidirectional, and lapse rates are weak. It would take a rotating storm to get some severe hail, and that is certainly possible with this shear. At 2040 UTC on the 27th 4.00 inch hail fell at Niagara Falls, NY. 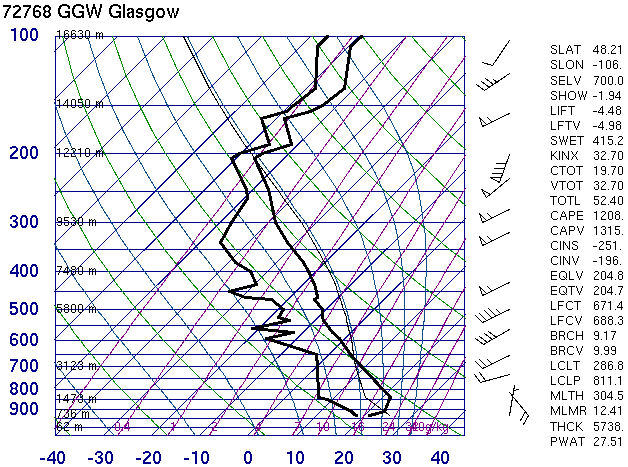 The sounding above was very likely not representative of the environment that the hailstorms were feeding on. 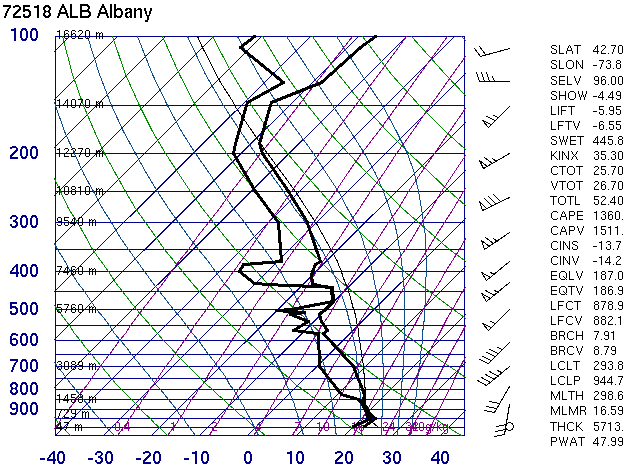 Though very close in proximity to the hailstorms, the sounding was 3-4 hours after the event. High: The CAPE/shear combination is outstanding. The only thing keeping this from not great are the lapse rates but the shear/CAPE should more than make up for that. This was mainly a flash flood/tornado event for south Texas. 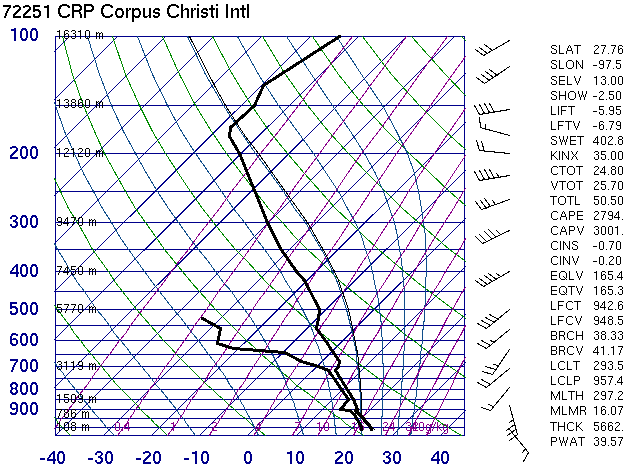 However, one storm south of the flash flooding and tornadic storms did produce 0.75-1.00 hail 50 miles north of Corpus Christi at 2:00 UTC. It was the only storm of the day with reported severe hail. Good: 1765 J/kg, some CIN. Good: 40 knots 0-6 km shear from 180 degrees of veering 0-3 km. Excellent: steep throughout the growth zone. Moderate: CAPE is good and there are great mid-level laspe rates. For a high threat, it's be nice to see a little better shear and higher CAPE. A supercell formed overnight in southwest Texas, and struck the KDFX (Del Rio) radome with 4.00 inch hail and winds to 84 knots. The combined effects of the enormous hail followed by the wind caused the radome to collapse. Several goats in the area were killed by the hail. Excellent: 0-6 km shear of 50 knots, 100 knot winds at 10 km, and strong veering. Slight: CAPE and mid-level lapse rates as low as this are the reason this is only slight. Although this sounding is on the east side of the Sierras, the wind shear was very similar in California's Central Valley. 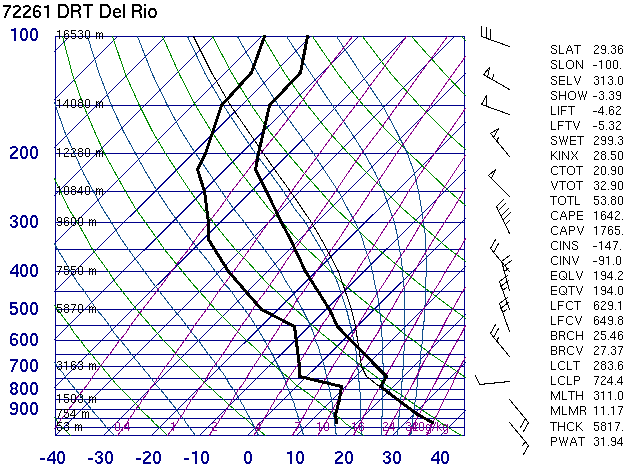 CAPE was probably slightly higher (800-1000 J/kg) in the Central Valley. A supercell produced 2.5 inch hail in Lemoore at 2250 UTC, as well as few tornadoes. Good: 0-6 km shear of 40 knots, with good veering. Moderate: Limiting factor is CAPE/CIN combination, would like more CAPE and less CIN. Monster supercell initiated along a warm front across eastern Montana (south of this sounding). The supercell produced up to 4.50 inch hail and large amounts of severe hail all along it's trek across eastern Montana. The softball hail fell from 23-00 UTC 40-50 miles southeast of Glasgow. Extreme downburst winds accompanied the storm as well. Excellent: steep from 0 to -20 C, and not too bad above that. Slight: need to see environment south of the warm front, but the steep lapse rates above the frontal inversion are impressive. Much like the Detroit case, a supercell initiated before noon in western Wisconsin, north of a warm front. SBCAPE south of the warm front was over 2000 J/kg, but surface temps in Wisconsin were in the low 50s. 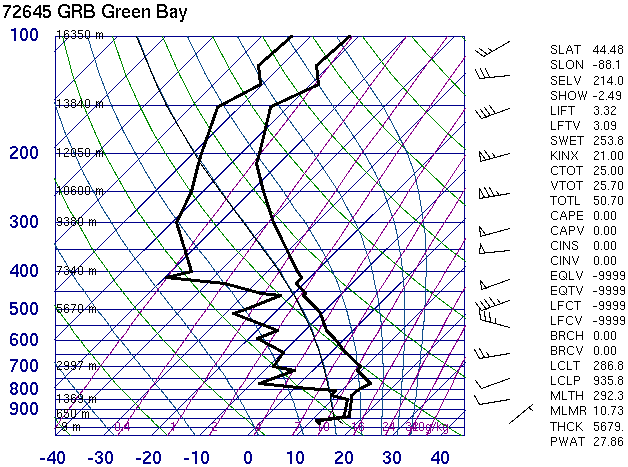 The supercell was a hail beast, with very wide swaths of severe hail and several reports of 2.00 to 2.50 inch hail, between 15-16 UTC and just south of Green Bay. The shear amounts of the large hail combined with severe winds did tremendous damage across central and eastern Wisconsin, making it one of the costliest storms ever to hit Wisconsin. Slight: Unusual to have a thermodynamic profile in the tropics like this. 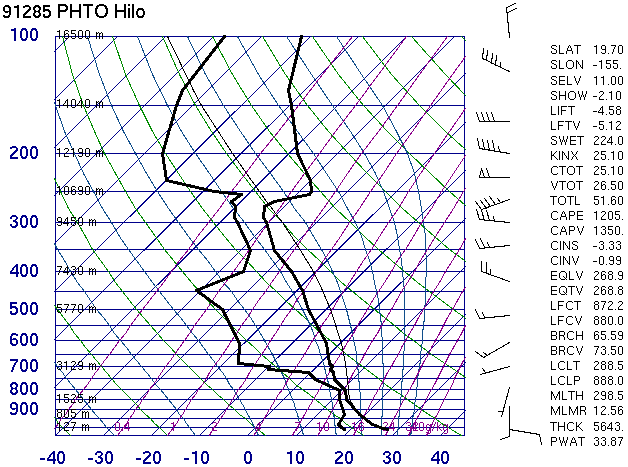 Because of the CAPE profile and decent lapse rates in the growth, severe hail is a possibility even in Hawaii. Storms formed all across Hawaii on the afternoon of the 25th. An F0 tornado was photographed on Oahu at 23:45 UTC. On the big island, there was one report of 0.75 inch hail, occurring at 1:15 UTC in Hilo (not a bad proximity sounding). This proves the point that if the right atmospheric conditions are in place, severe hail can occur anywhere in the U.S.
Elevated: The dry adiabatic lapse rates between 950 and 850 mb could lead to decent CAPE. Good: 40-50 knots 0-6 km shear, with great veering and 90 knot westerlies at 10.5 km. Jacksonville was just north of a warm front across northern Florida. SBCAPE just south of the warm front was around 1000 J/kg. A severe storm formed on the warm front about 20 miles southwest of Jacksonville. In Hampton, softball hail fell at 14 UTC, and there were several other reports of 0.75 inch to golfball hail across northeast Florida. This turned out to be a very significant tornado and large hail outbreak across much of Arkansas. From 20:30-02:00 UTC the LZK office logged 87 severe hail reports, with several reports larger than 3.00 inches (5.00 inch hail was largest). Numerous supercells were to blame for the hail reports, and the majority of the supercells were tornadic. For this event it is likely that dynamically induced vertical pressure gradients due to strong rotation within the storms siginificantly added to the hail threat, as enormous hail was produced with less than 1000 J/kg CAPE. Excellent: 3343 J/kg CAPE, very little CIN. 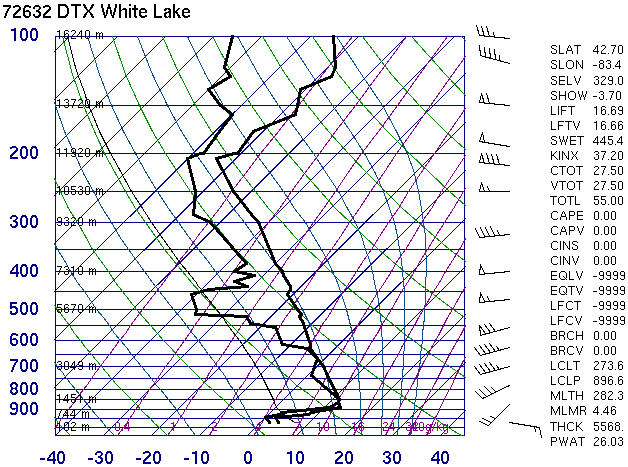 Decent: from 0 to -15 C, lapse rates are very good but then it goes through a cloud layer and it can't be discerned above -15 C.
High: CAPE and shear alone in this sounding is enough for a high risk of severe hail. 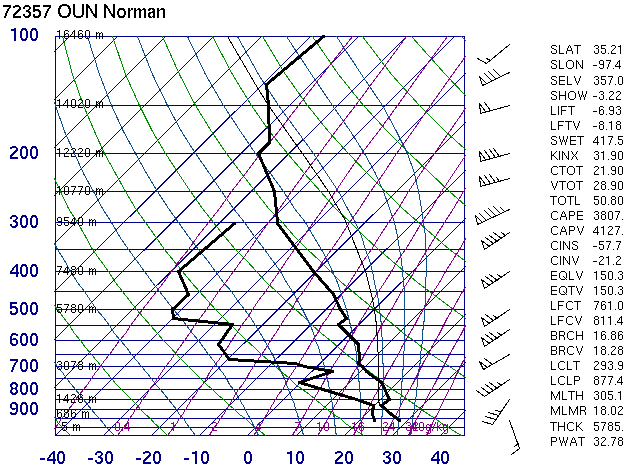 That dry layer in mid-levels indicates a severe wind threat in addition to the high risk of hail. Storm moved into central and eastern Minnesota by 20 UTC. From 21-0100 UTC MPX logged 27 severe hail reports, with a few baseball hail reports just west of Minneapolis around 00 UTC. Begin crying: ~55 knots shear 0-6 km, 95 knots at 9.5 km, strong veering profile. 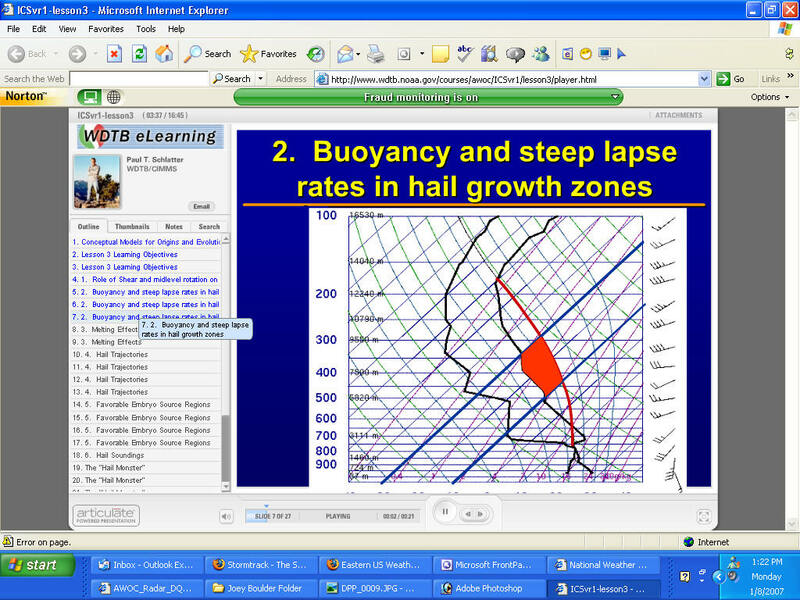 Excellent: nearly dry adiabatic in the hail growth zone. 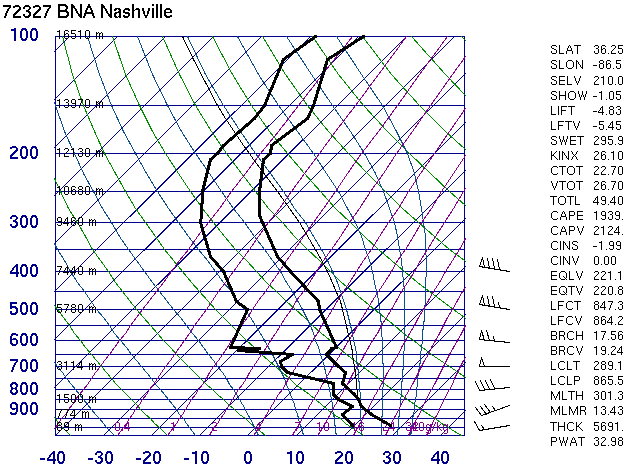 High: Much like the Nashville sounding, the ingredients are outstanding for severe hail, just about as high as you can get at the same time. A supercell moved across the Oklahoma City Metro area around 2130-2300 UTC, producing an F4 tornado. Although in terms of hail threat, this is just about as high each parameter listed above gets in the U.S. at the same time. However, this is essentially a null event in terms of hail. There was a lack of significant hail from that supercell. It passed directly over a metro area and there were just 4 hail reports, 2 at 0.75 and 2 at 0.88 inches. This is an example of storm microphysics playing an important role in hail production, as underreporting is unlikely in this event. Begin crying: 5117 J/kg CAPE, lots of CIN however. Need a trigger. 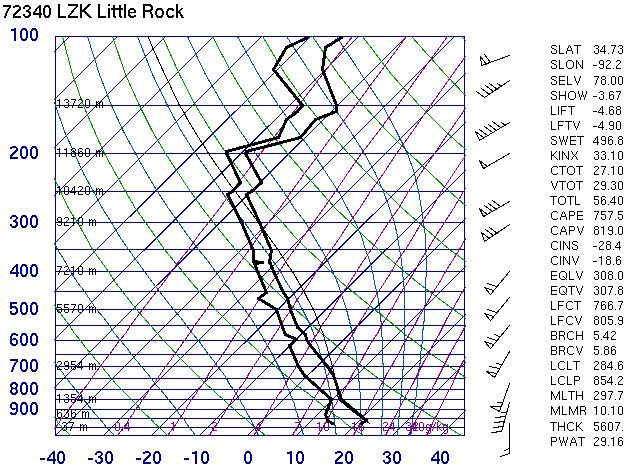 High: With the proper trigger, this sounding is a guarantee for severe hail for any storm that goes up. 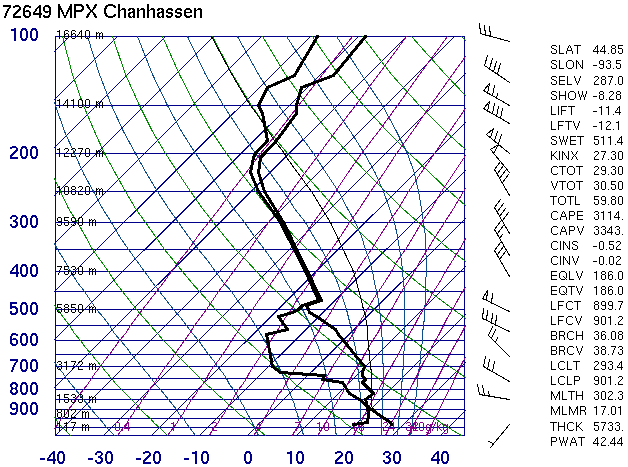 There is CIN on this sounding, but storms broke the cap along a warm front across Iowa and quickly became supercellular. This event really hammered the Des Moines CWA, with exceptional numbers of severe hail reports, and the majority of the reports were golfball and larger. Significant amounts of severe hail were reported from 16-23 UTC in central Iowa. Weak: 233 J/kg, no CIN . Good: 0-3 km shear is strong (40 knots), but 0-6 km shear just 20 knots. Weak: especially around -10 C.
Slight: This is a tough call putting any risk at all. There is some CAPE, pretty good shear but the shear is shallow. Freezing level very low so marginally severe hail shouldn't melt too much should it form aloft. 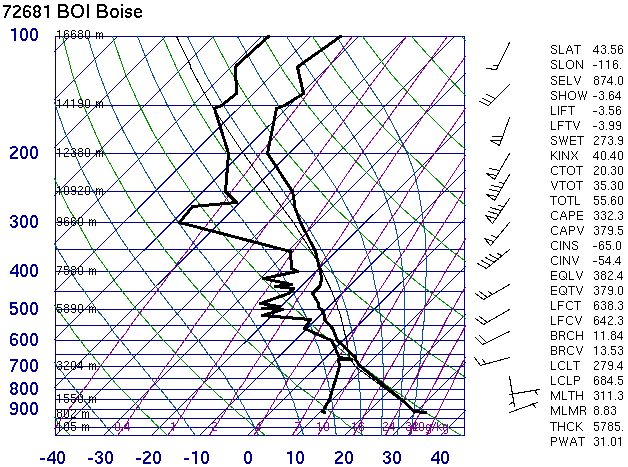 The upper level vorticity max was quite cold, as freezing levels in late June were at 9400 feet across Oregon. One report of 0.75 inch hail occured near Pendleton in eastern Oregon at ~00:00 UTC. Good: 0-5.6 km shear 30 knots, 0-7 km shear 80 knots, nearly unidirectional. Southwesterly winds of 115 knots at 10 km quite impressive. Slight: Much like the previous case in Oregon, this is a tough call since CAPE and lapse rates are far from ideal. However, the risk is certainly there with some CAPE and lapse rates good up to -25 C. That low freezing level should allow pretty much any size hail that forms aloft to reach the ground. Very low freezing level and low EL with a strong upper level vorticity maximum offshore of southern Califorina. A stationary storm over south central Los Angeles dumped extraordinary amounts of rainfall and small hail. None of the hail was "severe", but the amount of the small hail piled up into 2-3 foot drifts. Good: 2094 J/kg, no CIN. Nearly excellent. 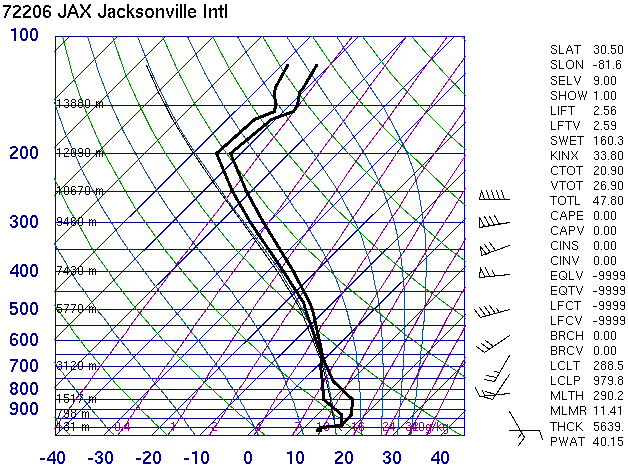 Decent: 0-6 km shear 15 knots, but 90 knot westerly jet at the tropopause. Some veering in the lowest levels. Moderate: The CAPE is great, shear/mid level lapse rates not high enough for a "high" threat. 20:50 UTC baseball hail reported in Baltimore County, MD, and at 23 UTC Washington DC had 0.88 inch hail. Good: 1215 J/kg, no CIN. Considering low freezing level, CAPE looks good. No CIN. Excellent: 0-6 km shear 50 knots, and 115 knots. Unidirectional however. 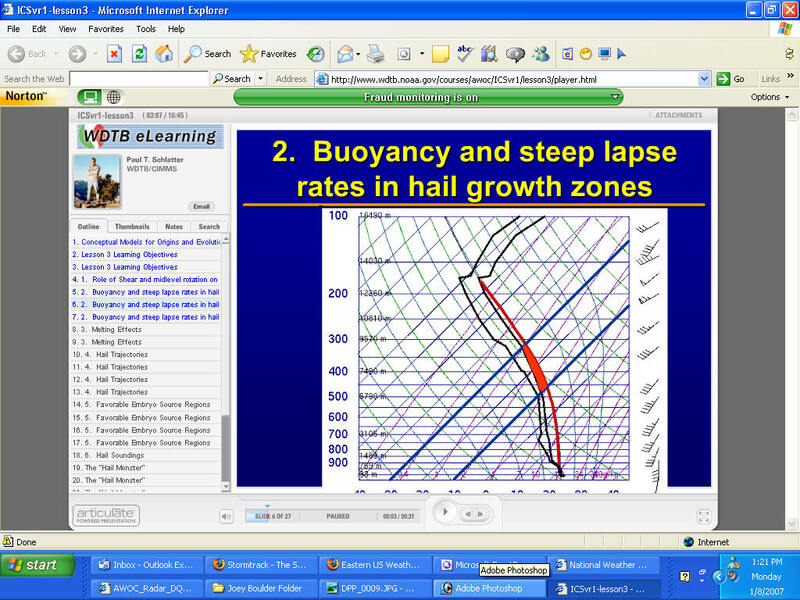 Moderate: CAPE/shear combinations plenty high for supercells. Lapse rates in hail growth zones also good. CAPE on the low side but considering the the cool environment it's significant. This is very close to "High". During the afternoon of Feb. 21, north and central Georgia was pounded by a line of supercells producing very large hail. No tornadoes were reported from any of the storms. Some statistics and specifics: 60 hail reports, some up to baseball in size. Metro Atlanta was especially hit hard, between 00:30 and 1:00 UTC, causing millions of dollars in damage. Good: 1951 J/kg, no CIN. Weak. Although you can find 15 knots max in the 0-6 km layer. Slight: CAPE alone should warrant a threat of hail, but in this environment, I would be surprised to see anything larger than 0.75-1.00 inch. 1945 UTC in Davie, Broward County, and a separate storm, 1945 UTC in Opa Lacka, Miami-Dade County. Slight: Close to moderate because of all the parameters being at least decent to good. Would not be surprised at a few 1.00 inch hail reports. Montrose County, Colorado at 20:20 UTC on 16 Aug 2005 1.00 inch hail was reported in Montrose. Further west into Utah, the storms were more intense. Flash flooding occurred in Moab. The big story was the large hail in the Green River, UT area (not much out there, take my word for it). At 23:45 UTC 1.50 inch hail was reported in Castle Dale, and at 00:00 UTC golfball hail was reported 20 miles southwest of Green River. Weak: ~10 knots at best from 0-6 km, nothing above that either. Weak: worse than moist adiabatic above -10 C.
None: Even though CAPE is good, the other 2 parameters are exceptionally weak, such that I doubt any severe hail falls for this event. Storms were numerous across southwest Louisiana. There were 3 reports of severe wind, but no reports of any hail. Good: ~40 knots from 0-6 km, but in reality the shear is shallow. 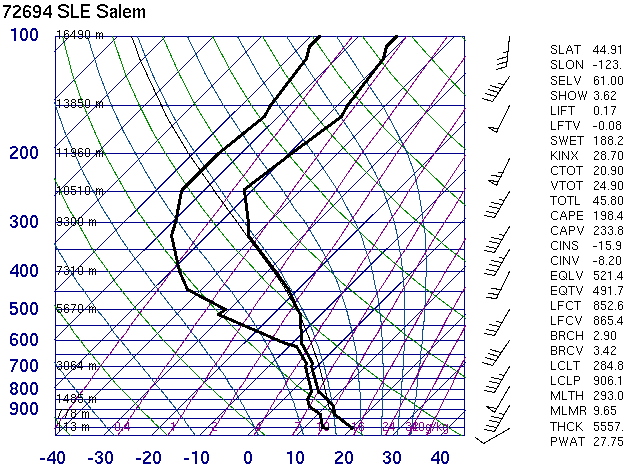 Decent: Inversion at -20C but all the CAPE is located above the 0C level so can't complain too much. Slight: Shear looks good from some rotating cells, no CIN, CAPE sufficient for some severe hail. July 21, 2005 was an active day for severe weather in the Reno area. At 1:30 UTC and 1:36 UTC Sparks, NV in Washoe County had hail reports of 0.75 in and 0.88 inch diameters, respectively. Very strong winds and flash flooding also plagued Washoe County throughout this time period from the line of convection.